TM 9-6115-651-14&P b. Figure 5-4. Lifting Generator Set. Installation. (1) (2) (3) (4) (5) (6) 5-4 WARNING When lifting generator set, use lifting equipment with a minimum lifting capacity of 5000 lb. Do not stand under generator. Do not permit generator set to swing. Failure to observe these precautions can cause injury to personnel or damage to equipment. 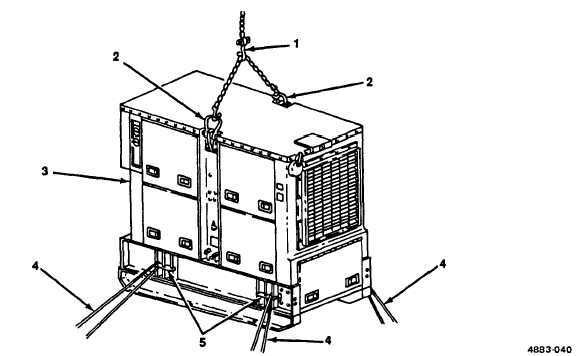 Attach lifting equipment with a minimum lifting capacity of 5000 lb (1, figure 5-4) to lifting eyes (2) on top edges of generator set (3). Insert a rope (4) through each of four tiedown cleats (5) on generator set. With one person at each rope to steady and guide generator set (3), lift generator set and carefully lower it onto trailer. NOTE Two center mounting screws on each side can be reached through cutouts in trailer frame under each fender. The two shorter mounting screws (5, figure 5-3) are installed at the front corner positions. Insert six screws (4, figure 5-3) and two screws (5) with beveled washers (6) down through generator set skids into trailer. Working under trailer install one Iockwasher (7) and one nut (8) on each screw (4) and (5). Position beveled washers (6) so that screw heads are parallel to tops of washers. While holding beveled washers in position, tighten hardware. Connect generator set ground wire (1) to trailer GROUND TERMINAL stud (3).